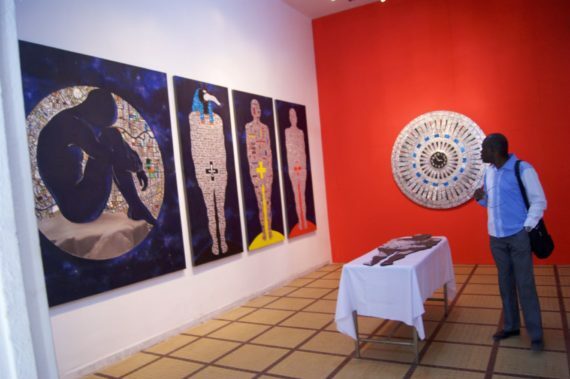 The 2018 edition of Dak Art Biennial, which is currently ongoing in the Senegalese capital Dakar, is a fine testimony of the evolution, progress and capacity of contemporary African art. Opened by Senegalese president HE Macky Sall, the festival, which has works of 70 artists from 33 countries on display, equally brought into the spotlight the issue of value for works by contemporary African artists. Dubbed “The Red Hour” and curated by the Cameroonian writer / art critic Simon Njami, the expansive range of artworks that have inundated the city of Dakar, is a clear indication of the multiplicity, complexity and universality of works that are being produced in Africa and the diaspora. 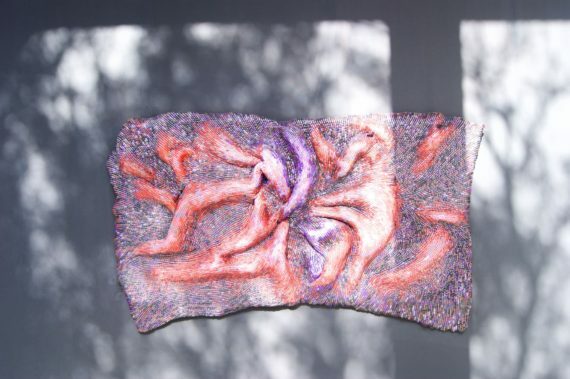 With support from Alya Sebti (IFA Gallery in Berlin), Bonaventure Soh Bejeng Ndikung (SAVVY Contemporary – Berlin), Marisol Rodriguez (Author – Mexico), Cosmin Costinas (Para Site – Hong Kong) and Marianne Hultman (Kunstforening – Norway), Njami included over 300 artists in the off-section thereby spreading artworks all over the city. 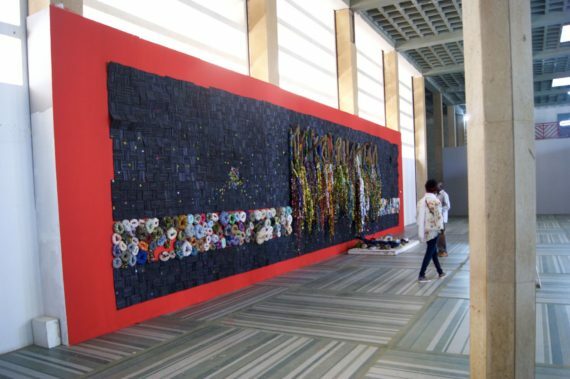 Nevertheless, a vast number of Senegalese appear not to be aware of the biennial, despite its international bearing – and the organizers must begin to find effective ways of attracting local interest and participation. 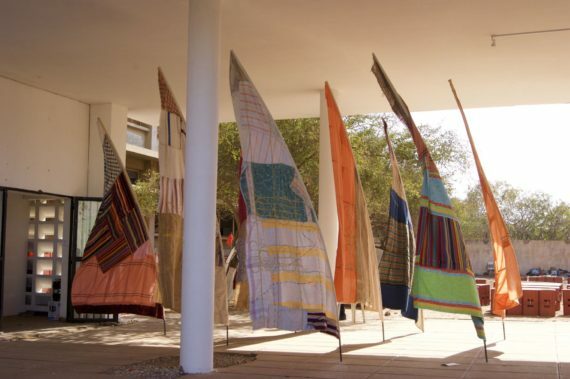 The biennial equally touched on issues relating to “Artists Rights / Marketing & Repatriation of African Cultural Properties”, “Innovative Funding for the Arts in Africa”, “Creating Value for African Contemporary Art” and “The Development of Infrastructure”. 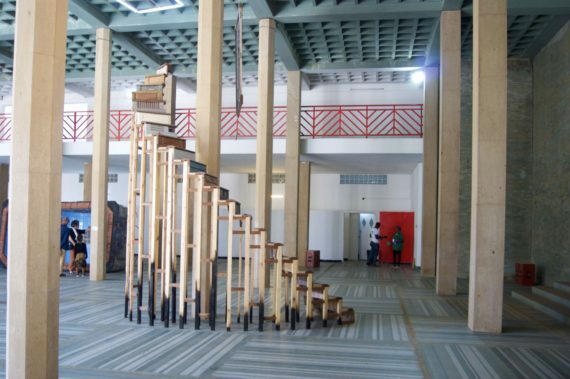 Diverse works fashioned out of materials including discarded metals, wooden boxes, colorful fabrics, wires, books, plastics and other recycled items appear to communicate with each other at a former Senegalese High Court, which housed the international exhibition. Noted for his large-scale sculptures that are mostly wall based, Ghanaian master El Anatsui’s works permeated a rather large well lit room with its intricately woven materials that constantly exude a luminous and majestic presence. UK based Ghanaian artist Godfried Donkor’s stock market prints from Financial Newspapers, which contain “millions” of data, are perched coolly on walls close to the entrance of this giant edifice as they transmit their queries on the commercialization of people. 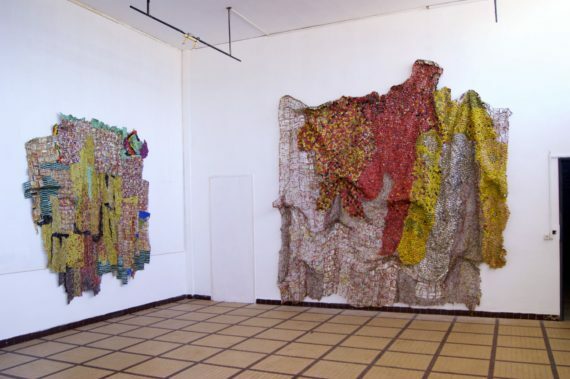 A gigantic work by the Nigerian artist Olanrewaju Tejuoso, comprise domestic waste that he turned into an award-winning piece while exploring a process of accumulation through artistic and visual heights. Cuban artist Juan Milano Benito presented a replica of a famous but out of use swimming pool from the 1950s in Cuba to depict failure. The piece indicates disappointment associated with diverse human endeavors and actions that continue to haunt us to this day. 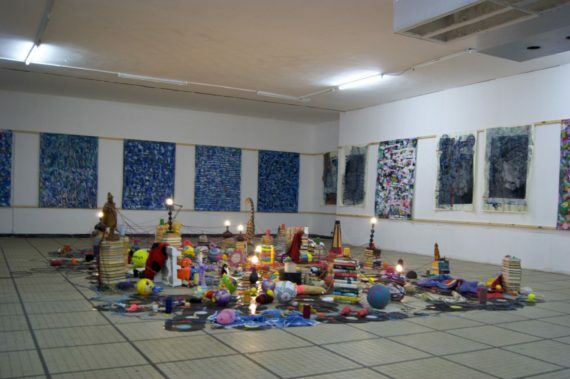 Moshekwa Langa from South Africa showcased a playful installation that reveals experiences of his life, which he maps and incorporates into his rather complex and adjustable installations. 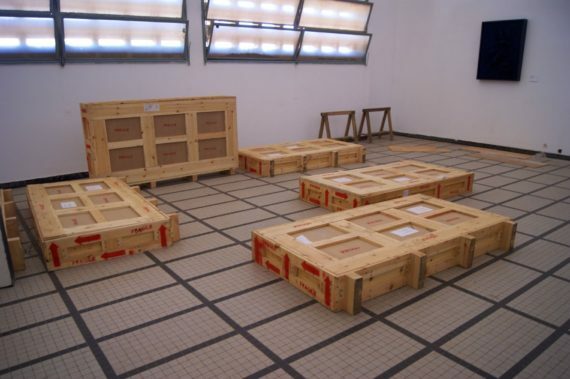 In their numeric strength, they encompass an archive of his life and works. Unassuming sculptures by France based Mozambican artist Téo Betin are characterized by a close attention to detail while bringing together diverse elements of a complete narrative. A staircase he constructed vividly establishes links with nearby objects. 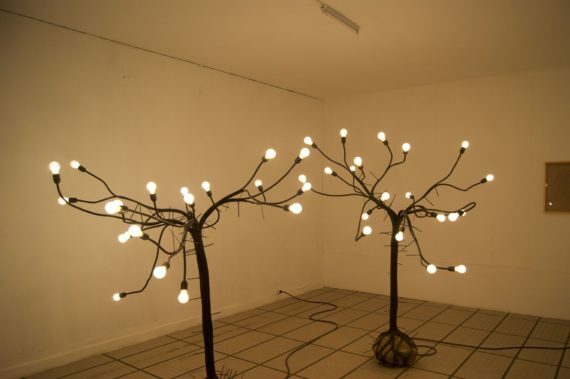 Moroccan artist Mohssin Harraaki installed a series of rocks that have been tired with black cables in the form of trees that end up as light bulbs. 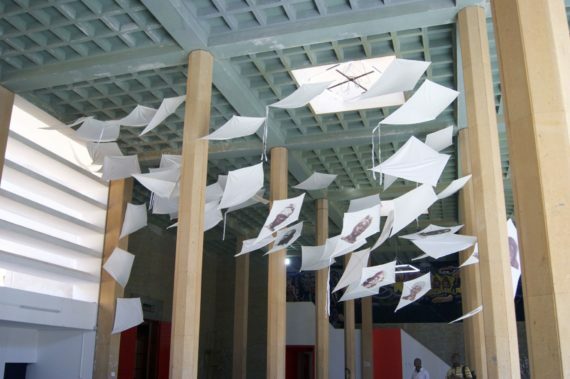 The installation, which expresses a diversity of ideas, is equally linked to genealogy, inheritance and history. Dak Art 2018, which ends on Saturday June 2, aims at being a space of different prejudice-free visions alongside approaches and inspirations that analyze issues in relation to a plurality of influences from both immediate and distant sources.